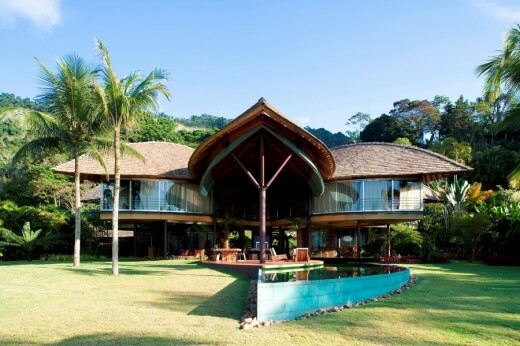 This project, Leaf House was inspired by Brazil´s Indian architecture, perfectly suited for the hot and humid climate where it stands, Angra dos Reis, one hour drive south of Rio de Janeiro. The roof acts as a big leaf that protects from the hot sun all the enclosed spaces of the house as the in-between open spaces, truly the most important ones. These in-between open spaces represent the essence of the design. They are the social areas, where the owner of the house and his guests spend most of their time. The very generous heights of these spaces, which varies from 3 to 9 meters, allow the SE trade winds from the sea to pass perfectly longitudinally trough the building, providing natural ventilation and passive cooling both to the enclosed and open spaces. 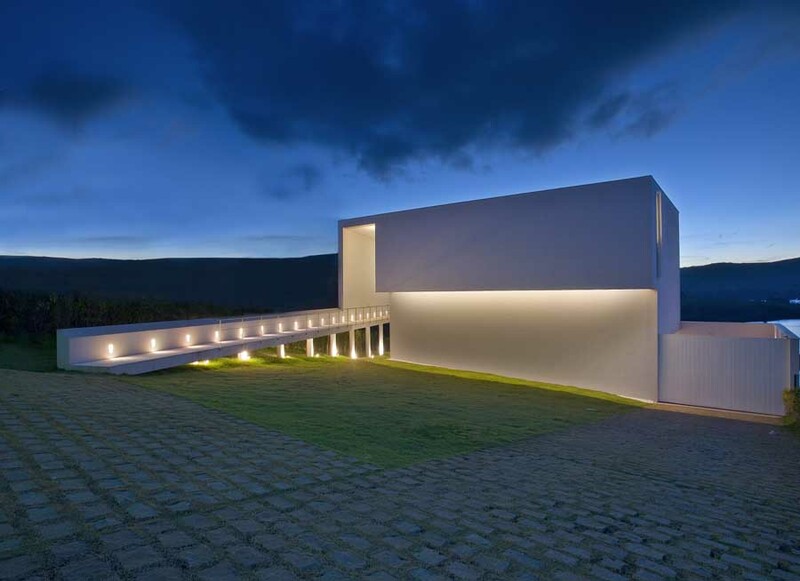 We see it as low-tech ecoeficiency, where it has the greatest impact, the concept of the architectural design. 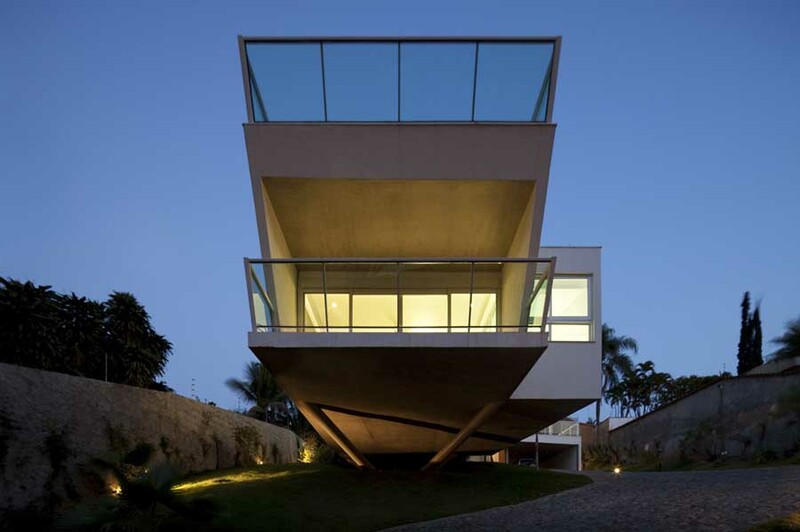 Our practice, luckily in agreement whit our client, understand the idea of a tropical beach house as a mean to enhance the interaction between man and nature, trying whenever possible not to separate them completely. There are no corridors and inside and outside are almost fused. Many sliding doors, most glazed, open up the enclosed spaces and let the sea breeze in. The landscape is everywhere on the ground floor, and the curvy swimming pool snakes into the house. When it passes below the formal dining room, it turns into a pond with aquatic plants and fishes, reaching the rear “verandah”. 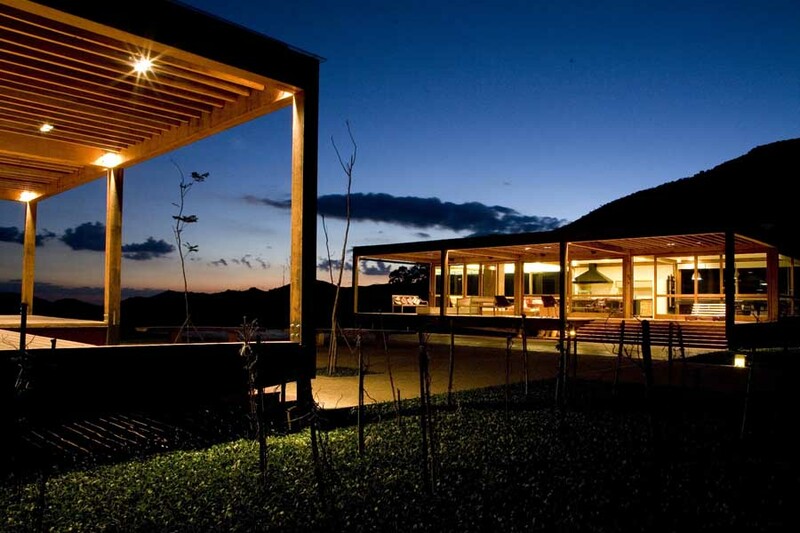 This veranda is a resting space with five Brazil´s Indians’ style hammocks. We call this space “Brazilian lounge”. The roof structure is made of laminated wood (eucalyptus, an Australian species planted in Brazil to serve as a fast renewable material source), capable of crossing big spans (20 meters is the biggest here) with delicacy and warm aesthetics. The roof is covered in small wood tiles (pinus taeda – also a fast growing renewable material source), that easily adapt to the complexes surfaces of it. It also collects rainwater via the central steel column to be reused in gardening and flushing toilets. All surfaces finishes, except for glass and pre-oxidized copper are natural: Grey tiles of stone from the site, bamboo meshes, local wood from management forests, earthy cement flooring and wood reused from old electricity posts. The use of all these natural materials, the transparency of the glass, the neutrality of the pre-oxidized copper relating to the prevailing green of the designed and natural landscape along with the organic composition of the house and rich diversity of textures and rhythms created a very desirable reality: The sensation of belonging to the site, in harmony with the exuberant Brazilian nature. Angra dos Reis is a Brazilian municipality located in the southern part of Rio de Janeiro state. It is located at an altitude of 6 meters and includes in its territory 365 offshore islands. It was discovered on January 6, 1502, but has been under continual settlement since 1556. Its population was estimated on 1 July 2009 to be 168,664 inhabitants. It has an area of 816.3 km². The neighboring municipalities are Paraty, Rio Claro and Mangaratiba in Rio de Janeiro state, and Bananal and São José do Barreiro, which are adjacent in São Paulo state.